North East Atlantic waters are inhabited by over 120 species of lobster and crab-like crustaceans. Accurate identification of their larvae is necessary for basic research into these animals and also in the assessment of adult stocks of the commerical species. The larval stages of many occur frequently in plankton but are often difficult to identify due to limited knowledge of their morphology. This identification guide will enable specialists and non-specialists to identify the larval stages of the majority of true crab species (brachyurans) that occur in the waters of the North East Atlantic Ocean. It includes detailed descriptions of crab larval morphology, methods of cultivation and an historical account of research in to crab larvae. 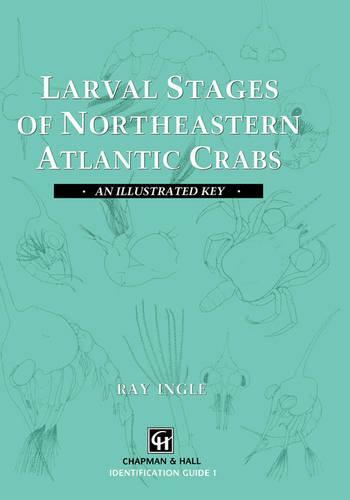 Illustrated taxonomic keys are provided for the larval stages of over three quarters of crab species occurring in the area. Full synonymies and diagnoses are given for the species together with a complete regional bibliography. This book should prove to be a standard work on the larvae of this commercially important group. This book should be of interest to undergraduates, postgraduates and researchers involved in marine biology and ecologists.